Any new technology naturally has a teething period and electric traction was no different. 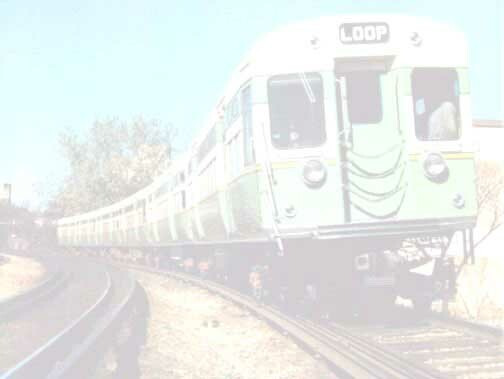 The Metropolitan West Side Elevated was the first "L" line to use electric traction when it opened in 1895 and the motormen were inexperienced with the new form of locomotion. There were several mishaps in the beginning, as might be expected, but most of these were minor. But, a rather notable one occurred on December 23, 1895 at the 48th Avenue Terminal of the Met's Garfield Park branch. Like many of the early stub terminals, the Garfield Park branch was designed to eventually be extended beyond its terminal, so instead of a formal and solidly-designed conclusion to the elevated structure, it literally just "stopped" at the street line, as if someone had simply chopped off the remaining structure to the west. All that prevented cars from continuing beyond the end of the tracks were a wooden fence across the end of the structure and simple bumping posts on the tracks. In the early morning hours of the 23rd, a westbound single-car local approached the terminal. As the train neared the station, the motorman apparently lost consciousness and fell asleep. The car continued right on past the station platforms, through the bumping post, off the end of the structure, and into the street below! The car settled at a 45 degree angle against the structure. The impact of the collision with the street broke every window in the car, but actually did little serious structural damage. The motorman, his conductor, and the lone unfortunate passenger in the car miraculously walked away with no serious injuries, only cuts and bruises. The Met quickly tied a heavy cable around the train and connected it to a large wooden hoist to lift the car back onto the structure. It took the Met's wrecking crew almost two days to lift the train back up. An investigation revealed that the sleepy motorman had actually been on duty for only four hours after having been off-duty for 24 of the previous 42 hours. But, in that time, he had only slept for four hours. This accident was the first of its kind on the Chicago elevated system. Luckily, accidents in which cars fell from the structure proved to be rare.